Typhoid and Paratyphoid are diseases caused by salmonella bacteria that effect in high temperature followed by a rash. Visiting or living in places where the disorder happens is a risk factor. 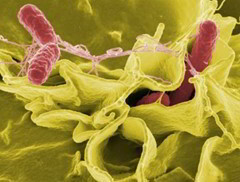 Typhoid and paratyphoid are nearly indistinguishable disorders that are brought on by the bacteria Salmonella typhoid and Salmonella Paratyphoid, respectively. The bacteria multiply in the intestines and distribute to the blood and to other organs, like the spleen, gallbladder and liver. The disorders are transmitted through contaminated faeces and most typically appear in places where hygiene and cleanliness are poor. Disease is usually due to food or water contaminated by unwashed hands. Rash of rose-coloured spots appearing on the torso, abdomen and back. If left untreated, both diseases can occasionally cause serious complications, like intestinal bleeding and, rarely, perforation of the intestines. Typhoid and paratyphoid can be diagnosed by testing blood or faeces samples for the bacteria. The disorders are generally treated with antibiotics in hospital. Symptoms typically subside 2-3 days after treatment has started, and most people recover completely in a month. Despite treatment the bacteria are excreted for about three months after the symptoms have vanished. A number of people who don’t experience treatment may become lifelong carriers of the bacteria and transmit the disease to others, although they seem to be healthy. Good hygiene is the greatest protection against disease. Several vaccines are available, and if you mean to travel to a developing country, immunization may be advisable. Consult your physician before travelling as recommendations change.